For those of us who have opted out of flesh for feasts, simply sitting down to the family gathering with a big, lifeless and featherless bird in the center of the table can present a challenge – and at the least offend the sensibilities. Whether you’re still in transition to plant-based eating or a longtime veteran, the issues are there, right along with the need for strategies to navigate a social situation that may – especially for the plant-based virgin – feel awkward. Traditional U.S. holiday feasts are cemented in carnistic thinking – seeing animals as edibles to be utilized for our palate’s desires. [pullquote] “Carnism” – in case the term is new to you – is the invisible belief system, or ideology, that conditions people to eat certain animals[/pullquote]. Those of us who see the world through a different lens – outside the ‘eating the animals’ box – can be made to feel like we are the oddballs. It seems we are given two primary options: either laugh off the jokes about our dietary plan, or stand our ground with dour tidings of the reality of the animals-on-your-plate world. Yet it’s possible to participate without being a killjoy. This is dependent on your confidence about YOUR choices, and letting go of any expectation about your choices making a difference for someone else. For one thing – trust me – your choices DO have an impact, even if made light of in the moment. It’s all planting seeds. People respond more to how you are and what you do than what you say. Here is a list of tips I hope you find helpful and supportive for your flesh-free Thanksgiving feast – Plantsgiving! 1) Your sense of humor. This is not only my first rule of fitness, it’s my first rule of survival in any venue. Give your militant side a rest and focus on the spirit of inviting others to feel at ease around you. This is not the same as encouraging actions in direct opposition to your ideology. Simply be the change you want to see in the world with lightheartedness. 2) Redirect skills. For some reason, it seems to be universal that when you opt out of something everyone else is opting in for – such as the turkey on the table – people feel threatened and defensive. This often shows up as an offensive attack on you. Simply choose to not get embroiled in the controversy and redirect the conversation. For example, if directly offered the poultry platter and along with it comes the comment “You don’t have any turkey! Don’t you want some?” Rather than freezing up or stumbling through a “I don’t eat animals” phrase, simply say – “Gosh, my plate is packed right now, everything looks so good! Who made the amazing green bean dish? The table looks gorgeous. Where did you come up with the ideas for the table decorations…?” and by the time you are done with the compliments, they’ll be on to someone else. Honestly? no one cares what you eat or don’t eat. We just think they do. 3) Compassion and love. This is definitely one of those times to focus on the positive. Family dynamics are hard enough without utilizing the venue as a soapbox for your deepest held convictions. Take your attention off of yourself and put it on those around you. I find that if I am prepared and industrious with questions about how others are doing, and ask questions about what is going on in their lives, you can actually get through an entire evening without a single person asking you anything about yourself. Evidently it’s true – people love to talk about themselves. And they will have a positive connection with their experience with you, which is actually the best way to be an influence for positive change. Model the behavior you’d like to see in the world and watch spirits uplift. 4) Plant food eats for everyone. Even if the host responds to your “What can I bring?” question with the “nothing”, always err on the side of generous and bring some eats. No fail choices are homemade bread, colorful salads, and veggie crudites with your favorite veg dip. A beverage – always! Remember, good food pleases everyone and you win hearts when you demonstrate how delicious your plant-based choice can be. Some simple appropriate suggestions are Cranberry sauce with dates and orange juice and Forks Over Knives Style Mushroom Gravy. Oh, and how about plant-based pumpkin pie? Books: The Plant-Based Journey: A Step-by-Step Guide for Transitioning to a Healthy Lifestyle and Achieving Your Ideal Weight, The China Study, Whole: Rethinking the Science of Nutrition, Forks Over Knives. 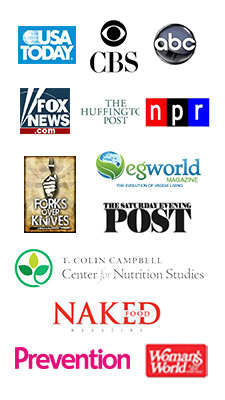 Video: Forks Over Knives, Fast Food Nation, Supersize Me, Fat Sick and Nearly Dead. 6) Humility. No need to announce to everyone that the beautiful dish you are setting on the table is “all vegan and fat free!” Unless you have an appreciate crowd, this will fall on all ears as “your food is bad, my food is good”. That may not be what you said, but that’s what they’ll hear. As silly and off the mark as this may be, you know it’s true. Keep your ego on a short leash and let people enjoy what you’ve brought simply because it is so dang good. 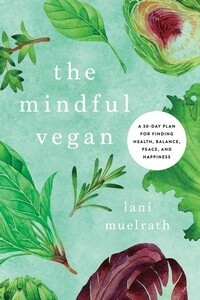 And thank you so much for your continued support of The Plant-Based Journey and your generous reviews on Amazon. 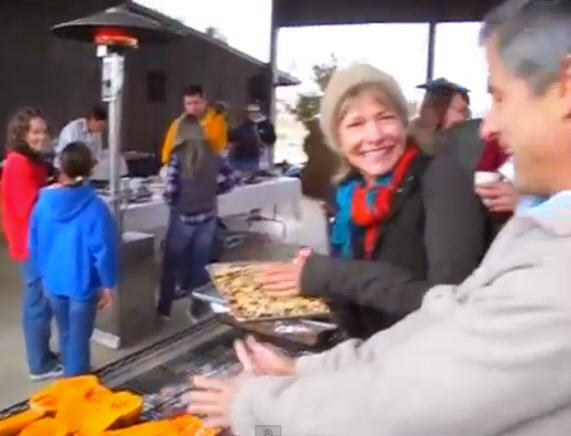 Have you something to add to my list – something that you’ve found to be helpful at the Thanksgiving gathering? Please share in comments blow. What a relief to read this article. I have been struggling with how to approach Thanksgiving and your ideas have given me some simple things to do. It all just makes me feel more relaxed, thank you! I like the idea of coming with some food to share and also the ideas about ‘redirecting’ as you so describe it. I’m so glad that just a couple of suggestions have eased your mind. You’ll think of more as you go, too…it is a skill we get better and better at! I appreciate your notes – happy holiday! Good tips. Fortunately my family is small and my sister eats similarly. A couple of years ago she bought the equipment to deep fry the turkey. That way we can banish the carnies outdoors to deal with he hot oil and carcass. Hey vegpedlr – now there’s a thought! Yes, there are those of us fortunate enough not to be the only plantpeople at the table – but I can remember the days way back when when it wasn’t so! I appreciate your note and have a great holiday! Lani, thanks for the simple yet so very important ideas you give us for “Divided Kitchen” holidays! We know where we stand – no need to beat our loved ones over the head with our point of view. No one listens when they feel threatened. Let the food speak for itself and when needed, be ready to laugh with others and redirect potential negative energy. Really, right On Point – Thank You! Thanks so much. You’re right about the ‘Divided Kitchen’ analogy! You sound like a woman at peace with her choices – this is huge! I got an email just before reading your message from a reader who thought my site is ‘too plant-based’. Isn’t this about plant-based fitness? My readers count on me for plant-based right along with the fit, and therein lies a very unique strength. I very much appreciate your verbalizing your support – happy holidays to you! Sandy, great! Where are you by the way? Of course they apply to any traditional family feast! Sounds like a unique situation! You have a lovely attitude and I’m betting you are a joy to be around on Thanksgiving – the best promo for your dietary choices. Are you making one of the pies from the ‘6 pumpkin pie recipes’ post, or have you another to share? I will be the only plant based person at the table, and it does bring some anxiety. Butter, cheese, cream, eggs and lots of meat will be in every dish. I will probably eat something before I go which is my usual way when going to gatherings. I will also take some kind of dish I can feel confident eating (as long as they don’t try to add a dollop of butter on top!). I love the term Plantsgiving! Eating in advance is so smart – good plan! You’ll be fine. Did you see the new plant-based pumpkin pie collection posting? Maybe take one of these to share? Darn. I thought this would suggest six dishes. It’s tough to come up with things that can be served at room temperature for a holiday. I clicked on this from the McDougall board. Sorry I did. Hi Lani! I just wanted to let you know I prordered the New Happy Herbivore Thanksgiving cookbook last night. I was told I needed to let you know. Sounds like a good purchase! I’m curious as to where you were told to let me know – ? Please do tell! Thanks Lani! Your tips are great! When I mentioned that I was going to bring some sides I received a sarcastic remark of “you mean food that only you will eat?”. So I am looking for some great recipes to take for “my dinner” that I am sure everyone will try! Lol. Actions speak louder than words! Funny thing turkey wasn’t even served during the first Thanksgiving! So I am on a search for great recipes! Have a great holiday vegan style! Rosemary, grrrr…people can show their discomfort in the wildest ways, somehow when it is an “offense” comment like this it seems particularly unkind. But if we step back and put on our compassionate spectacles, we can see it for what it just might possibly be – a complete projection on the part of the speaker. Which gives an opening here for developing a good response. Maybe “I can’t help but think you’ll love this one too!” or something like that? I’ll have to think about it. 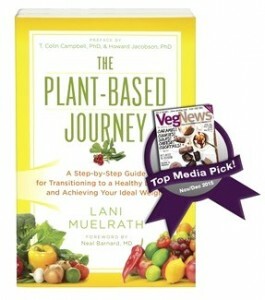 Next, have you a copy of The Plant-Based Journey? Crowd Pleasers and Can’t Misses chapter was written just for this. The Black Bean Polenta Pie is always a hit, even with die-hard carnists. Serve with the Sour Cream from the 7 Sauces That Sizzle bonus gift (did you get that? It’s for purchase of 2 copies of PBJ) and or/guacamole, and wowza. Everyone loves the Cranberry Sauce with Oranges and Dates, too! Charzie, I love this and am going to ask you to promise to follow up with me on how this goes. It has the potential to help a whole lot of people who can learn from your experience. And how clever to leverage your birthday! Happy birthday! Lani, I just posted on your FB page about how I am struggling to stay on track. I have done so much to try to educate myself on staying plant based. I think I was actually getting a bit overwhelmed on how to make it through this holiday season. I had asked you about how to mentally convince myself to stay the course. After reading the above article…I know one thing. I need to keep your book close at hand. I need to build the confidence needed to make it through one day at a time. I know what I need to do…I just have trouble sticking to my guns. My cravings get the better of me and I crack and give in. Thank you for all your encouraging advice. Have a fantastic Thanksgiving! Diane, I just responded to your post of fb! Let me go fetch what I said – “Hi Diane, thank you so much for your note and boy I HEAR you! This is why I wrote The Plant-Based Journey. The doctors and dietitians give us the foundation of plant-based nutrition but where’s that missing link, how to connect it with your reality? That’s another story isn’t it. We need sustainability – long term shift and success. Something to move us forward through the vicissitudes of life and the pull of practices from the past. I am thrilled that you are enjoying my book. How far through are you? And yes, I offer private consult and coach at 3 different options, if you want I can link you to the place to find those on my site. Let me know how else I can assist and talk soon! This is so helpful. Thank you! I think I’ve done all the things you say not to do at previous Thanksgivings. This time I will lighten up and just enjoy everyone who is there. April, I am very happy to read your message. We can become so committed to our cause that we forget how to be kind and compassionate to the people at our elbow. It can be challenging when they are piling on their plate what looks like violence to us, but bullying and shaking fingers has not done as much to help people rise to the occasion as much as being kind and acknowledging and compassionate of others. I wish you the best of holiday seasons and let me know how it goes!